It snowed again today, all day. I really do love snow, but this winter has been a bit much. I guess I should have splurged and bought those snow shoes this year. Last week, in the midst of all the ice and cold, I convinced myself that spring will come eventually and signed us up for a farm share. Mountain View Farm is just around the corner from us, and from June through October we’ll be making a weekly visit to the farm to pick up our just-picked veggies. We’ll also be able to pick our own herbs, beans, berries, flowers, and peas. We’ll even be able to use the farm for walks and picnics. Since we’ll be getting tons of vegetables each week we’re sharing our share (ha) with a couple friends. The ideas in the book The Omnivore’s Dilemma, by Michael Pollan have really influenced the way I think about food. With the farm share, we’ll be eating food that is grown so very locally, in a sustainable way. It’s not always easy to eat local and sustainably grown food, but at least for the summer and fall the farm share is a great solution. Eating food grown and raised right here is heavily promoted around these parts. The area CISA (Community Involved in Sustaining Agriculture) is highly visible– their ‘Be a Local Hero’ bumper stickers are plastered all over Valley cars. 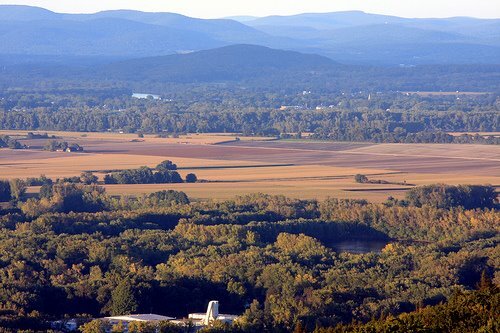 Agriculture is a big part of the lifestyle and economy in this part of New England, and there is a sense of responsibility to keeping it that way. Community Supported Agriculture (CSA) farms are getting more popular, and farm shares are even available in urban areas. To find a CSA farm in your area, check out Local Harvest. It’s good for you and good for your community. Photo by Flickr user Asmey145. E & I had a farm share a few years ago with the < HREF="http://www.denisonfarm.com" REL="nofollow">Denison Farm<>. It was excellent, and highly recommended. You will definitely be giving produce to friends! Enjoy! ooh. I am so jealous right now! Thank you for posting the local harvest link. I have a new tab waiting for Dave and I to see where we can have a share tooo!! !